Hello all! There are many things happening right now, in April, and much to look forward to in the next few months! I’ll tell you much more about them in just a bit. March, on the other hand, was a heavy month. The heaviness was caused by the passing of three people in a short span of time. It weighed heavily on my mind but even more on my heart. It started with the sudden passing of my 33-year old cousin. Then, about a week later, my uncle who had a single lung transplant last year, passed away as a result of an infection. Finally, a week later, another young child we knew from the hospital who had a heart transplant, passed away. I could say many, many more things about these three people and how each death affected me personally, as the words have been forming a web of thoughts in my mind, but the heaviness feels too much for this forum. Amongst these dark clouds, life continues on. Hana had another check-up with the heart transplant team. She got a clean bill of health and they came up with a new steroid taper schedule. As I made the prescribed decreases in her steroid, Hana ate less, whined more, experienced intermittent diarrhea and seemed more tired. Finally, last Tuesday she just didn’t want to get out of bed. She would go to the bathroom and go right back to bed. She would sit up to take her medicines and go right back to sleep. The transplant team at Stanford decided they wanted her to come in. My heart always sinks when I hear this. It means the possibility that this is something serious. She finally did get out of bed at 1pm in time to go to Stanford. Right before we were about to get in the car, Hana had a massive vomit. I haven’t seen anything like it since before her transplant. My heart sank again that day and I hoped it was just caused by the chocolate ice cream and glass of milk that she chugged. The first words out of Hana’s mouth when she woke up at 1pm was, “I want chocolate ice cream.” Now, this is such an unusual request that I decided to grant it. In addition, I rarely give Hana a glass of milk to drink. So there you have it. They did an echocardiogram at Stanford and everything looks the same. This was very reassuring. Plus, she was eating a little bit and her energy was a little better. They decided that her symptoms were probably caused by weaning off the steroids. They could still be caused by an underlying GI virus, but time will tell if going back up on the steroids does not alleviate symptoms. It did not seem to be caused by rejection, which is what had everyone worried. I am happy to report that in the last week Hana has greatly improved. Her energy and mood are much better. She is eating more. She has lost some weight and is looking a little skinnier than usual but I expect that to improve. We will try tapering again in a couple more weeks, but even more slowly. Hopefully she can be off the steroid in time for her next biopsy on May 7th. I guess they see an increase in rejection when patients go off steroids and since Hana has a history of this, we need to hope and pray that she can handle this with no more episodes of rejection. Other than this fun, Hana has been enjoying Forest School two days a week, dance class and swimming. She also loves going to the playground, playing with friends and checking out tons of new books from the library. For the rest of the family we are all doing well. We got to enjoy a weekend near Lake Tahoe recently and Hana got to play in snow for the first time. Corrina is going to have her first birthday soon! Paul has been busy with work and some golf. I have been working on a few stealth projects. One of my not-so-stealth projects is building a team for the upcoming Summer Scamper on Sunday, June 24th in Palo Alto. This is the race event that benefits the hospital where Hana is treated. I have registered our team, Hana’s Heart. This year, we want to dedicate the race to the family and donor of Hana’s heart. Our whole family will be walking again in the 5K. I decided to stick with the family again this year instead of running. Hana will be participating in the Fun Run for 3-year olds! I think she is going to be very excited. If you want to join our team, please sign up by going to the Hana’s Heart team page and clicking on “Join Team”. This year, if I can get my act together, we are going to do t-shirts and hopefully a team picnic after the event. I have no excuse like last year (“I just had a newborn”) to get things done! Look for more about the Summer Scamper and the Hana’s Heart team in the coming weeks. 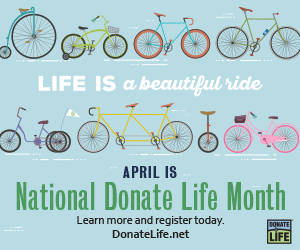 April is National Donate Life Month! If you aren’t a registered organ donor, do it now! I’ve decided to make myself an advertisement for Donate Life and raising awareness about the importance of organ donation. I’ve made and am making some t-shirts to wear, especially when I am out for a jog. Check back for updates on how that is going! And don’t forget, register to be an organ donor! Tell your friends and family too!